As you can imagine, people often have a lot of questions about our life, besides the rude ones. Most people have no idea what life with triplets and a big sister entails and they cannot imagine how we get through a day. This series was started after my grandfather asked a simple question, “How do you put the kids to bed?” And from there it went. 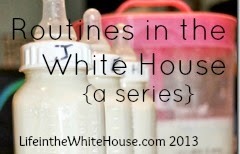 Join me as I share what things work for us, here in the White House.